For the removal of a multitude of particulates the unique ONE Cartridge Tank filter system is the ideal solution. It’s designed for residential to larger commercial applications as it replaces smaller, commonly used cartridge filters and is available in two different configurations. Utilizing large capacity cartridges ONE Cartridge Tank filter system greatly extends replacement cycle times. Where pre- or post-filtration for particulates is needed ONE Cartridge Tank filters are perfect. 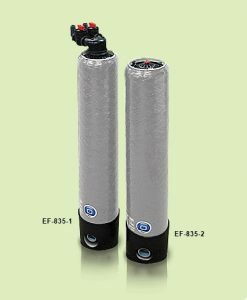 Equipped with a top mount valve including bypass and is available with three different cartridge types (see literature) the EF-835-1 Cartridge Tank offers excellent filtration and outstanding retention capabilities, due to it’s size, for residential and light commercial applications. Available with two different cartridge types (see literature) the EF-835-2 Cartridge Tank is designed with a 2″ inlet/outlet connection located at the bottom of the tank, making this system ideal for commercial and industrial applications.